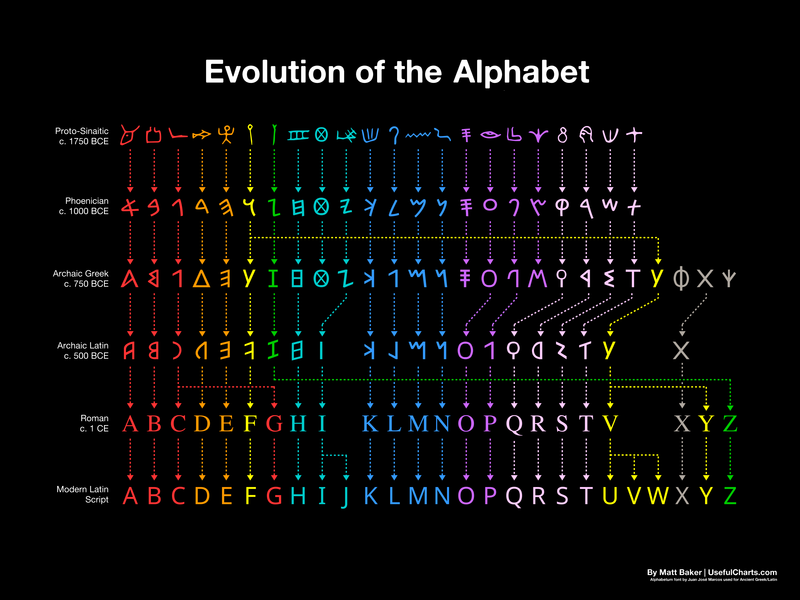 I originally titled the chart “Evolution of the English alphabet” and many people commented that there is no such thing as an English alphabet and that the chart should be titled “Evolution of the Latin alphabet”. Actually, both titles are correct. Obviously, many European languages use the same Latin script. But some use a slightly different number of letters. When one is referring to the set of Latin letters used for a particular language, it’s ok to refer to that set as the “[language name] alphabet”. However, in the end, in order to be more inclusive, I decided to change the title to simply “Evolution of the Alphabet” and use the row titles to make it clear that it is the evolution of the standard Latin script that is being shown (as opposed to say, the Cyrillic or Hebrew scripts). Baker also created a handy video explaining this evolution.